Almost all of us get stuck often with media playback when a movie playback leads to a situation where you could only hear the sound and there were no video? Or only video and no sound? or sometimes both audio and video missing and your player says it doesnt support the media files. All these things result when a codec is missing! on your system. For those of you, who dont know what a codec is, A codec is a device or computer program capable of encoding and/or decoding a digital data stream or signal and its required for playing your media files smoothly. So it will be good if some tool tells us which codec is missing from the system and we can download it and install it. CodecInstaller is a tool that can tell you this and help you understand which codec you need and install it in minutes. It can analyze files: it supports avi, mpeg, wmv, wma, ogg, flac, mpc, mp3, mp4, wav, wx and will show technical data such as width/height and ratio, length, video codec, framerate, size, bitrate, total frames, quality factor and metadata such as title, album, year (if available). An advanced feature of CodecInstaller is the Filter Mappings Editor (see screenshot), a tool that will let you change the priority and the types of media a filter will process. Another feature targeted to power users is the ‘remove filter‘ functionality: you will be able to either unregister a filter (and see a list of other filters that will be affected) or lower its merit value: the effect is that the filter won’t be used anymore. CodecInstaller contains a Movie Launcher that displays informations about the distributed video file (author, plot, director…) along with a screenshot and a ‘Play’ button. Just a caution. 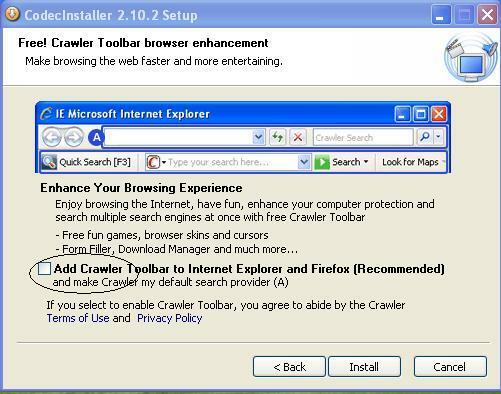 When you install it, during the installation a CRAWLER toolbar option is checked on by default. You should untick it if you dont wana add a toolbar to your internet explorer and firefox. I recommend you to untick it as i did.